Cover of the first light novel volume featuring Kaname Chidori (foreground) and Sousuke Sagara (background). Full Metal Panic! (フルメタル·パニック!, Furumetaru Panikku!, often abbreviated to FMP!) is a series of light novels written by Shoji Gatoh and illustrated by Shiki Douji. The series follows Sousuke Sagara, a member of the covert anti-terrorist private military organization known as Mithril, tasked with protecting Kaname Chidori, a hot-headed Japanese high school girl. Individual chapters are published on Monthly Dragon Magazine, followed by a paperback compilation released by Fujimi Shobo's Fujimi Fantasia Bunko. The novels are split between stories focusing on Sousuke's mission as a soldier of Mithril and comedic side stories centered on his life at Jindai High School. The series has been adapted into different media; including four anime television series: Full Metal Panic! by Gonzo in 2002, Full Metal Panic? Fumoffu and Full Metal Panic! The Second Raid by Kyoto Animation in 2003 and 2005 respectively. An OVA was also released in 2006; and the newest television series, Full Metal Panic! Invisible Victory by Xebec, premiered in April 2018. The series also had several different manga series. Tokyopop licensed the novels for English-language publication in North America and released parts of the series, while ADV Films licensed and dubbed the first season and the spin-off. The second season was licensed by Kadokawa Pictures USA with ADV Films producing the dub yet again. Mandalay Pictures acquired the film rights to the series in 2009. At Anime USA 2009, Funimation announced that it had acquired the rights to the first and second series of Full Metal Panic! and both were re-released and remastered on DVD and Blu-ray in 2010. The series began airing in North America on November 22, 2010, on the Funimation Channel. The Fumoffu series made its North American television debut on the Funimation Channel on November 15, 2010. A spin-off to the light-novel series called Full Metal Panic! Another was serialized between 2011 and 2016. Another received a manga adaptation split in two series, the second of which is still being published. The series follows Sousuke Sagara, a member of a covert anti-terrorist private military organization known as Mithril, tasked with protecting Kaname Chidori, a spirited Japanese high school girl. He moves to Japan to study at Chidori's school, Jindai High School, with assistance from his comrades Kurz Weber and Melissa Mao. Having never experienced social interactions, Sousuke is seen as a military maniac by his schoolmates as he interprets everyday situations from a combat perspective. He comes to relate with Chidori who realizes that Sousuke is protecting her, but he does not reveal the reasons due to orders as well as the fact that he does not know why Chidori is being targeted by different organizations. When starting the series, Shoji Gatoh commented that as the series' theme was "Boy Meets Girl." Gatoh worked in the order to keep that as the focus regardless of the several other conflicts the story presented. Gatoh and Shiki Douji had a close relationship in the making of the novels. Gatoh gave Douji freedom in the design of the characters such as Sagara and Leonardo who were given multiple traits. On the other hand, Gatoh also gave Douji references for "gentlemen" featured in the story. Chidori and Sousuke's relationship was based on Japanese comedy due to how the two interact. In order to create a more interesting dynamic between the two leads, Gatoh wanted to change the ways Sagara and Chidori interact as he was tired of female characters requiring to be protected in the making for the light novels. As a result, Chidori instead supports Sagara multiple times. 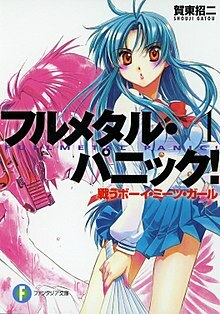 The light novel series Full Metal Panic! is written by Shoji Gatoh and illustrated by Shiki Douji. It was serialised by Fujimi Shobo in its monthly magazine Gekkan Dragon Magazine since June 1998 and published under the Fujimi Fantasia Bunko imprint in tankōbon format since September 1998. Gatoh often found delays in writing of the novels, which led to delays to the publication of the series' volumes. The series focuses on Sergeant Sousuke Sagara's arrival to the Jindai High School where he was assigned to protect the student Kaname Chidori while also acting as a student. A total of twelve full length volumes have been released from September 18, 1998, to August 20, 2010. In parallel to the twelve volumes, nine autoconclusive light novels of the series (which form the short story collection) have also been published from December 17, 1998, to August 20, 2011. Finally two more volumes titled Side Arms focusing on the past of some characters (which form the side story collection) and the birth of Mithril and Amalgam have been published on April 20, 2004 and July 20, 2006. In contrast to the full length volumes, short story collection focuses on the comedy elements from the series. In January 2010, Gatoh wrote another of these stories in celebration of Gekkan Dragon Magazine's 300th issue, which has been included in the last short story collection volume. Another series of spin-off novels has been released by Naoto Ōguro with supervision of Shoji Gatoh from August 20, 2011 to February 20, 2016, consisting of thirteen volumes and set years after the original series' ending. The light novels have also been adapted into various manga, as well as three anime television series and an OVA episode for which Gatoh was also part of the staff. Tokyopop licensed the Full Metal Panic! series for North America release, publishing the first regular light novel on September 11, 2007. The latest released volume is the fourth on February 1, 2011, which is a compilation from the original fourth and fifth full length volumes from the series. No short story collection volumes nor side story collection ones have been published and the company has shut down its publishing operations in North America on May 31, 2011. In 2015, at Anime Expo and San Diego Comic-Con, Tokyopop announced that it would be relaunching its publishing operations in North America in 2016 and that they will consider light novels, but nothing has been disclosed about Full Metal Panic! novels publication. On March 18, 2019, J-Novel Club announced that all the original 12 novels will be translated again and released in English. Full Metal Panic! was adapted into a manga on several occasions. The first series entitled Full Metal Panic, was serialized in Monthly Comic Dragon by Retsu Tateo. The first Full Metal Panic! manga was collected in nine tankōbon volumes published from August 30, 2000, to July 1, 2005. Full Metal Panic! was one of the first manga licensed by ADV Manga, being announced in July 2003. They released all of its volumes from November 10, 2003 to April 11, 2006. A parallel series entitled Full Metal Panic! Comic Mission (フルメタル・パニック! Comic Mission), was also written by Retsu Tateo and focuses on the comedy elements from the series. Seven volumes were published from November 1, 2003, to September 1, 2006. Another spin-off series is Full Metal Panic! Overload! (いきなり! フルメタル・パニック!, Ikinari! Furumetaru Panikku!) by Tomohiro Nagai. It was released in five volumes from January 30, 2001, to April 1, 2003. Overload was licensed by ADV Manga in December 2004, and all of its volumes were published in English from June 6, 2005, to May 24, 2006. Nagai also wrote Full Metal Panic! Surplus (フルメタル・パニック!SURPLUS) which is a single tankōbon manga published on July 1, 2003, focused more on the action elements from the franchise. Next manga adaptation Full Metal Panic! Sigma (フルメタル・パニック!Σ) was written by Shoji Gatoh and illustrated by Hiroshi Ueda and focuses on the missions of Sousuke as a sergeant. The first volume was published on August 1, 2005, and the last volume, the nineteenth, was published on September 20, 2013. Its events are based from the fourth Full Metal Panic! light novel onwards. The anime series was produced by Gonzo Digimation and originally aired in 2002 after its original air date was canceled because of the September 11 attacks. The series was licensed by ADV Films for North American release in 2003. The first three novels form the basis for the anime. The series was available on the Anime Network on Demand from 2003 to 2004. The production of 3 director's cut movies based on first television series was announced in 2017. The 1st SECTION Boy Meets Girl was premiered on 2017-11-25 at Kadokawa Cinema Shinjuku in Japan. 2nd SECTION One Night Stand was premiered on 2018-01-13. 3rd SECTION Into the Blue was premiered on 2018-01-20 in Japan. Home video releases for the movies were planned for 2018-02-28 for the 1st movie, followed by 2018-03-28 for 2nd movie, and 2018-04-28 for 3rd movie. Full Metal Panic? Fumoffu! (フルメタル・パニック? ふもっふ!, Furumetaru Panikku? Fumoffu!) is a companion series to the anime series Full Metal Panic! by Kyoto Animation, and takes place between the first season and The Second Raid. Markedly different in tone to the first series, Fumoffu emphasizes the high school romantic comedy aspects of Full Metal Panic! with often crude humor and focuses on the romantic tension between Sousuke Sagara and Kaname Chidori. It frequently parodies itself and anime stereotypes. None of the mecha combat or political intrigue, which characterized much of the original Full Metal Panic!, can be seen in the series. The only reference to the mecha aspect of Full Metal Panic! is the Bonta-kun, which is one of the most prominent parodies in the anime. Sousuke uses spare Bonta-kun costumes to make highly effective suits of power armor, but they look like teddy bears wearing army gear and can only say: "Fu" and "Mo" in different combinations. Full Metal Panic! The Second Raid (フルメタル・パニック! TSR, Furumetaru Panikku! TSR) is the direct sequel to the original anime series. It was produced by Kyoto Animation and ran for 13 episodes. The series is based on the Ending Day by Day novels and takes place three months after the events that occurred in the Tuatha de Danaan at the end of the original Full Metal Panic! series. Mithril learns of a secret organization that has technology able to counter the ECS (Electronic Conceal System) mode. The organization, known as Amalgam, has access to Black Technology, which was obtained from the Whispered. Like the other intelligence agencies, Amalgam intends to obtain more. Sousuke's mission to protect Chidori is terminated by Mithril, instead leaving her in the care of an anonymous agent known as Wraith. There is a one episode OVA that takes place after Full Metal Panic! The Second Raid. It's a humorous stand-alone story. It focuses on the Captain of the Tuatha De Danaan: Teletha Tessa Testarossa, rather than the two main characters of the series. The OVA is based on short story Wari to Hima na Sentaichou no Ichi Nichi (A comparatively leisurely day of the squadron commander) in short story collection Dounimo Naranai Gori Muchuu (Helpless in the thick of it). The story is also told in chapters 13 & 14 of Full Metal Panic Sigma manga volume 4. Home video releases also included episode 000 and 7-part Location Scouting in Hong Kong documentary. Episode 000 includes footage from various parts of the television broadcast episodes, but also includes new scenes. Location Scouting in Hong Kong documentary includes various locations the television production staff members had gone to as inspiration for creating scenes used in the Hong Kong episodes, featuring appearances from the series producers, and commentaries from them. Full Metal Panic! Invisible Victory (フルメタル・パニック! インビジブル・ビクトリー, Furumetaru Panikku! Inbijiburu Bikutorī) is the fourth TV series in the franchise produced by studio Xebec. It premiered in April 2018. During Anime Expo 2017, the series creator confirmed that Full Metal Panic! Invisible Victory is a "continuation" that won't contain any "explanation or expository episodes." He stated that the pacing of the story is going to be "full throttle from the get-go" although it would still "follow the original work pretty closely." The series consisted of 12 episodes. The opening song is "Even...if" and the ending song is "yes", both performed by Tamaru Yamada. A live action film adaptation was announced by Mandalay Pictures in April 2009, with Zac Efron rumored to be attached to the project. Efron has since confirmed a meeting took place regarding the project but added that the adaptation was unlikely to happen. Writer and director Kenneth Lindbloom announced in an interview with ASO radio, released March 2012, that a fifteen-minute live action fan film, Full Metal Panic! Come Make My Day, was in post production and due to be released sometime in 2012. The project was undertaken by a group of professionals and enthusiast with the goal of creating a high-quality portfolio piece based on the Full Metal Panic! novel Come Make My Day. Full Metal Panic! Fight! Who Dares Wins, developed by B.B. Studio and published by Bandai Namco Entertaiment Inc., was released on 2018-05-31. Specialist Box limited edition includes Invisible Victory behind-the-scenes Blu-ray, a special novel by Shoji Gatoh, drama CD, replica autographed mini script of "Megami no Rainichi: Date Hen," a case for the Blu-ray and CD, and a special Shiki Douji-illustrated box. Early purchases include download code for the 'Armed Slave-Use Special Weapons Three Set' (Boxer 2nd Revision 76mm Shot Cannon (Armor-Piercing Ammunition) Cartridge Extension Model, ASG96-B Revision 57mm Glide Cannon, GRAW-X Single Molecule Cutter (Repulsion Field Prototype Model)). The second DVD volume of Full Metal Panic! The Second Raid was given a favorable review by Theron Martin of Anime News Network for pushing the character developments of Sousuke and Kaname as well as dramatic elements beyond comedy and action. Describing the impact of the volume, Martin explains that "[t]he full impact of that [Sousuke and Kaname's relationship] comes out beautifully in episode 7, when Kaname seeks out Sousuke in a moment of fear and, for the first time, Sousuke isn't there for her. It's one of those telling moments that can define an entire series." THEM Anime Reviews has noted that the Arm Slaves, like most real life vehicles, are done so meticulously that fans of mecha series would "scour online catalogues for tech books and sketches." Bureau 42 says that the "mecha[Arm Slave] action in the show is very well done. While I can't compare the action with other more grounded mecha shows like Patlabor, the combat is very well done and easy to follow, and visually interesting." Triforce commented that Arm Slave battles in the Full Metal Panic! series would be able to keep viewer's attention to the show. Negative criticism has surfaced on the role of the Arm Slaves throughout the Full Metal Panic! series. For instance, Ender's review states that their mecha roles are confusing that the Arm Slaves are both "08th MS Team soldiers and Dragon Ball Z-type fighters, hurling energy balls at each other and going "Super Saiya-jin." Anime Database rated the Full Metal Panic! series 4 out of 5 because of the Arm Slaves battles since they start out from being good to being very unrealistic. GameSpot Union comments on the relationship between the Arm Slaves and the animation done on Full Metal Panic!, saying both animation and camera views were bad. The novels have over 11 million copies in print. ^ a b "Interview: Full Metal Panic's Shoji Gatou and Shiki Douji". Anime News Network. Retrieved April 25, 2018. ^ a b c "フルメタル．パニック！" (in Japanese). Retrieved April 26, 2016. ^ a b "フルメタル・パニック！シグマ（１）" (in Japanese). Reader Store. Retrieved April 25, 2016. ^ "フルメタル・パニック！ アナザー(1)" (in Japanese). Niconico Seiga. Retrieved April 24, 2016. ^ "フルメタル・パニック！0―ZERO―(1)" (in Japanese). BOOK☆WALKER. Retrieved April 24, 2016. ^ "フルメタル・パニック！0―ZERO―(1)" (in Japanese). Niconico Seiga. Retrieved April 25, 2016. ^ a b "フルメタル・パニック！０―ＺＥＲＯ―（１）" (in Japanese). Reader Store. Retrieved April 25, 2016. ^ "フルメタル・パニック！ アナザーΣ(1)" (in Japanese). Niconico Seiga. Retrieved April 24, 2016. ^ "フルメタル・パニック！アナザー∑" (in Japanese). Niconico Seiga. Retrieved April 25, 2016. ^ "TV Animation Full Metal Panic! Director's Cut (Official Site)" (in Japanese). Retrieved July 13, 2018. ^ "Tokyopop New York ComicCon 2007". Anime News Network. Retrieved 2007-02-24. ^ a b Zeitchik, Steven (April 6, 2009). "Mandalay nabs rights to 'Full Metal Panic'". The Hollywood Reporter. Retrieved March 7, 2011. ^ "Funimation Announces Three New Titles". Toon Zone. 2009-11-21. ^ Gatoh, Shoji (2010). Full Metal Panic! 12. Fujimi Shobo. p. 97. ISBN 978-4-8291-3553-2. ^ a b "Interview with Full Metal Panic! Creator Shoji Gatoh and Illustrator Shiki Douji". Asia Pasific Arts. Retrieved April 25, 2018. ^ "News: Full Metal Panic's Next Novel Listed for July Release". Anime News Network. March 20, 2010. Retrieved March 14, 2011. ^ フルメタル・パニック！フルメタル・パニック！－サイドアームズ－ 音程は哀しく、射程は遠く (in Japanese). Kodakawa Shoten. Retrieved August 5, 2016. ^ フルメタル・パニック！―サイドアームズ２ ― 極北からの声 (in Japanese). Kodakawa Shoten. Retrieved March 15, 2010. ^ "News: Last Full Metal Panic Light Novel Volume Being Written". Anime News Network. January 5, 2010. Retrieved March 14, 2011. ^ "News: Full Metal Panic Spinoff Novel Project Starts This Summer". Anime News Network. May 6, 2011. Retrieved May 6, 2011. ^ a b Hiroshi, Ueda (2005). Full Metal Panic! Sigma, Volume 1. Fujimi Shobo. p. 162. ISBN 4-04-712416-8. ^ Gatoh, Shoji (2003). Full Metal Panic! The Anime Mission. ADV Manga. ISBN 978-1-4139-0027-9. ^ "Full Metal Panic! (Novel) Volume 1". Tokyopop. Archived from the original on October 12, 2007. Retrieved October 28, 2007. ^ "Full Metal Panic! (Novel) Volume 4". Tokyopop. Archived from the original on January 21, 2011. Retrieved February 1, 2011. ^ "News: Full Metal Panic Novels 4 & 5 to Ship in U.S. Next February". Anime News Network. June 6, 2010. Retrieved March 13, 2011. ^ "Tokyopop Plans Manga Publishing Relaunch, More Projects". Anime News Network. Retrieved 2016-08-05. ^ フルメタル・パニック!1 (in Japanese). Kodakawa Shoten. Retrieved March 15, 2010. ^ フルメタル・パニック!9 (in Japanese). Kodakawa Shoten. Retrieved March 15, 2010. ^ "ADV Announces Manga Line". Anime News Network. July 7, 2003. Retrieved March 14, 2011. ^ "Full Metal Panic! Volume 1". Amazon.com. Retrieved March 12, 2011. ^ "Full Metal Panic! Volume 9". Amazon.com. Retrieved March 12, 2011. ^ "フルメタル・パニック! Comic Mission" (in Japanese). Kodakawa Shoten. Retrieved March 15, 2010. ^ "フルメタル・パニック! Comic Mission:7" (in Japanese). Kodakawa Shoten. Retrieved March 15, 2010. ^ いきなり!フルメタル・パニック!1 (in Japanese). Kodakawa Shoten. Retrieved March 15, 2010. ^ いきなり!フルメタル・パニック!5 (in Japanese). Kodakawa Shoten. Retrieved March 15, 2010. ^ "New ADV Manga". Anime News Network. December 20, 2004. Retrieved March 13, 2011. ^ "Full Metal Panic: OVERLOAD! Volume 1". Amazon.com. Retrieved March 12, 2011. ^ "Full Metal Panic: OVERLOAD! Volume 5". Amazon.com. Retrieved March 12, 2011. ^ "フルメタル・パニック!SURPLUS" (in Japanese). Kodakawa Shoten. Retrieved March 15, 2010. ^ フルメタル・パニック!Σ 01 (in Japanese). Kodakawa Shoten. Retrieved March 15, 2010. ^ フルメタル・パニック!Σ 19 (in Japanese). Kadokawa Shoten. Retrieved October 13, 2013. ^ "Japanese Anime Pulled Because of WTC". Anime News Network. 2001-09-28. ^ "Full Metal Panic! Anime's 1st Season Gets 3-Film 'Director's Cut'". Anime News Network. 2017-09-19. ^ "Full Metal Panic! Invisible Victory TV Anime Reveals Full Title". Anime News Network. January 19, 2017. Retrieved January 19, 2017. ^ "Full Metal Panic! Invisible Victory Anime Premieres in Spring 2018". Anime News Network. July 1, 2017. Retrieved July 1, 2017. ^ "Full Metal Panic! Season 4 Release Date Confirmed: FMP: Invisible Victory Trailer Shows Light Novel Story". Inquisitr. July 7, 2017. Retrieved July 7, 2017. ^ Sherman, Jennifer (March 29, 2018). "Full Metal Panic! Invisible Victory Anime Listed With 12 Episodes". Anime News Network. Retrieved March 29, 2018. ^ "Zac Efron: Not 'Likely' to Be in Full Metal Panic! Project - Anime News network". Anime News Network. Retrieved 2009-04-16. ^ "Anime Podcast ASO Radio -Interviews". ASO Radio. Retrieved 2012-03-27. ^ "Behind The Scenes -Full Metal Panic! Come Make My Day". FullMetalPanicTheMovie.com. Archived from the original on 2012-12-17. Retrieved 2012-03-27. ^ Martin, Theron (2007-01-29). "Full Metal Panic! The Second Raid: DVD 2". Anime News Network. Retrieved 2009-05-19. ^ Jason Bustard. "T.H.E.M. Anime Review's Full Metal Panic". T.H.E.M. Anime Reviews. Retrieved 2009-09-07. ^ Dave (2008-09-06). "Review: Full Metal Panic". Bureau 42. Retrieved 2009-09-07. ^ "Trifoce's Full Metal Panic! review". Archived from the original on 2009-03-04. Retrieved 2009-09-07. ^ Ender (2005-10-16). "Anime Academy's Full Metal Panic! review". Anime Academy. Archived from the original on 2010-01-04. Retrieved 2009-09-07. ^ "Anime Database's Full Metal Panic! Review". Anime Database. Archived from the original on 2004-04-11. Retrieved 2009-09-07. ^ Gr33nHippo (2008-07-12). "Full Metal Panic! Review". Anime Cafe, Gamespot Union. Retrieved 2009-09-07. ^ Hodgkins, Crystalyn (2015-10-24). "Full Metal Panic! Novels Inspire New Anime Adaptation". Anime News Network. Johnston, Chris (November 2006). "Full Metal Panic! The Second Raid Volume 1". Newtype USA. 5 (11). p. 151. ISSN 1541-4817. Wikiquote has quotations related to: Full Metal Panic!